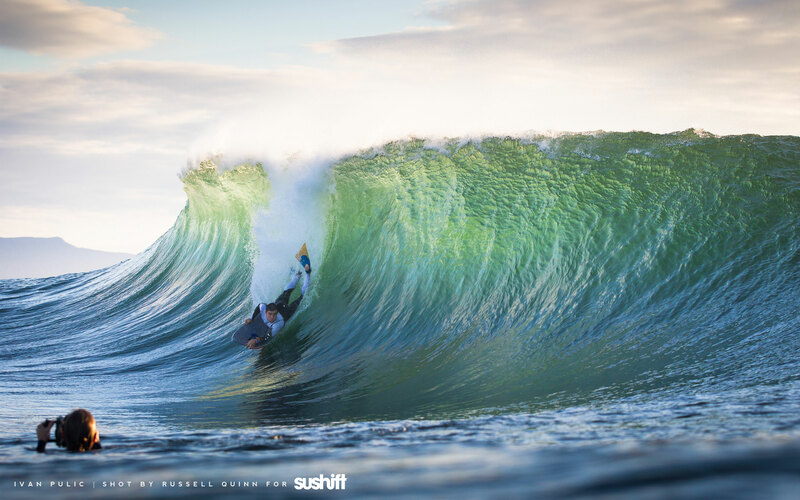 This is a special week with a cool wallpaper from Sushift™ featuring our team Rider Ivan Pulic, shot at one of his local reef on a sick day by photographer Russell Quinn. We thought it’d be cool to ask Russell about the shot wince we’re releasing that shot as a free wallpaper download for desktops and mobile phones. Enjoy! How to download? It’s simple just click on the Desktop and/or Mobile image above and then when it opens in a pop-up window just right-click on the image and download to your computer. Enjoy! - Where and what day was it? This image was taken a few winters ago at a fairly well-known reef on the NSW South Coast, Australia. The local gatekeeper is Moot Young, who has been surfing it for over a decade now, I think. - How do you guys link everything together for a shoot? Did you connect before or just showed up there? Ivan and I have been shooting together for more than six years now. We first started surfing together, and then as I started shooting more we just continued to chase swells together, except with me behind the lens. We are always in contact when there’s a swell on the horizon, and luckily we both have the freedom to chase it when it’s good. - Is it hard to get the angle on that particular wave or you’re just paddling in the channel between sets? By most people’s standards it’s a pretty straightforward wave to shoot, but as it gets bigger you can get strong currents that pull you into the impact zone, particularly if you’re shooting fisheye. This day I was shooting 70-200mm, so I could easily sit on my board in the channel and only have the occasional wide one to negotiate. Other than that it’s a pretty fun wave to shoot. - What gear / equipment did you shoot this particular shot with? For this shot I used a Canon 1D Mk 4 and 70-200mm 2.8 II lens, inside an Aquatech housing. - Is the rider aware of the photographer in the channel and stuff and do you communicate between waves or just let the rider(s) do its/their thing and hope for the best? I think when you chase swells with a photographer the rider is always aware of the photographer’s position in the channel and generally they work together to make the shot happen, but we are both fairly relaxed about it all and I just let him do his thing. Ivan is also really patient and waits for only the best waves, which works well for me too. - Do you often shoot or see Ivan in the water? Yeah we’ve been shooting together for around six years and seem to work together really well. I recently bought a Ski with my brother, which we use for general leisure more than anything, but it has come in handy when the waves are good and Ivan is around to shoot with. - How is it knowing your shot will be used by a magazine or a brand? For me, the most rewarding thing about shooting is either seeing it in print, or used by a company to promote the rider, whether it’s print or online. Ivan is a top bloke so I stoked to see him get any exposure, and if it’s my shot then that’s even better haha.